I lovely little package arrived from Kristin yesterday for the Mini Quilt In A Bag Swap 3 - Lovely Logs. I sent her the fabric for the center of some sort of log cabin blocks and then she came up with the rest. I have one ready to send to her today hopefully. Here is the fabric she sent for the centers of her log cabin blocks, I can't show the rest until she has received her little quilt so check back in about a week for that. 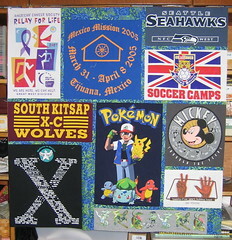 Yesterday, I also got a start on the t-shirt graduation quilt. I was having some trouble picking a fabric to use between the t-shirts but finally got that at my LQS yesterday, got it prewashed and got started. Here is my start and if things go well I might have the top done tonight. I was hoping to have a mini quilt retreat this weekend since my husband and daughter will be out of town for a workshop but you know what they say about best laid plans. I will be having some interruptions but I still hope to get a good bit of sewing done around them. 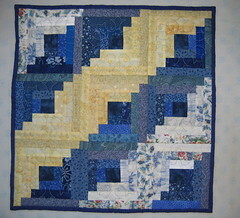 Since I finished the hand quilting on my Row by Row quilt I have gotten started up on my Cathedral Window Quilt again. It is coming along nicely, if slowly.